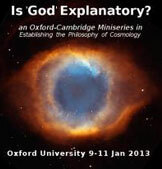 Second Oxford Miniseries: Is ‘God’ Explanatory? This miniseries will explore the theological and, by extension, metaphysical questions that pertain to cosmology. The origin and order of the cosmos have helped inspire belief in a “Supreme Being” or “First Cause” for millennia; but what bearing, if any, does the modern scientific approach to studying cosmology have on such beliefs? Does introducing God into the discussion add anything? Lectures can be viewed on YouTube Videos.